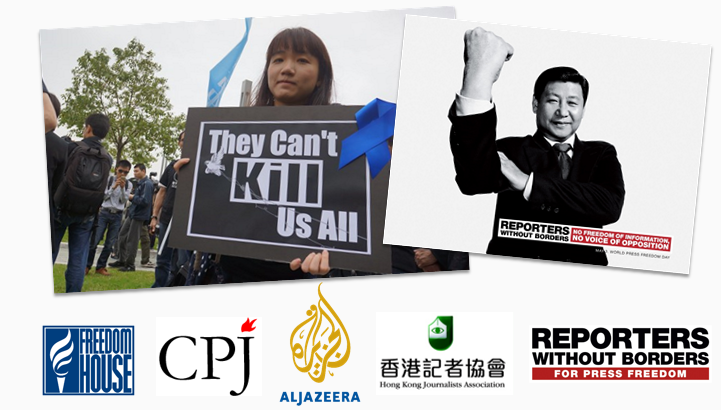 It has been a tough year for press freedom in Hong Kong with Reporters Without Borders, the Committee to Protect Journalists and Al-Jazeera all reporting on the declining state of media freedoms in the city. There were six attacks on journalists in the past year, advertisers have been withdrawing from media critical of the establishment and HouseNews – a popular liberal news website – was forced to close this summer after its owner was threatened. Late last year, a new television broadcaster, HKTV, was denied a free-to-air licence – mass protests ensued as demonstrators complained that the government’s decision was a political one. The Hong Kong Journalists Association recently stated that it has been “the darkest year in decades” for media freedom as media owners become fearful of harming business interests in the mainland. Though Hong Kong is home to a wide range of print media titles, there is a deficit in terms of political plurality. There is a surplus of publications on the ‘pro-establishment’ side – some of which are direct mouthpieces of the Chinese Communist Party. Newspapers such as Wen Wei Po, Sing Tao, Oriental Daily, The Sun and Ta Kung Pao – which are supportive of pro-Beijing viewpoints – are balanced only by the Apple Daily, a tabloid, on the opposing ‘pro-democracy’ end of spectrum. The South China Morning Post and Ming Pao occupy the middle-ground, albeit with an increasing slant towards Beijing. Despite there being no ‘top-down’ censorship in Hong Kong, the ‘fourth estate‘ has – arguably – been failing in its responsibility to keep the powerful in check. Thus, Hong Kong has seen the rise of the ‘fifth estate.’ Bloggers and citizen journalists are filling gaps when it comes to critical analysis and breaking news. Media freedom issues have particularly come to the forefront during the recent ‘Umbrella Movement’ occupation protests. Online news platforms – usually with a pro-democracy slant – blossomed during the ‘Occupy’ demonstrations. InMedia, SocRec, Post852, Speak Out HK, and United Social Press were disseminating photographs and stories from the front lines throughout the protests. Newer platforms such as student group Scholarism’s Dash Media rose to prominence, as did Passion Times – the publishing arm of the radical Civic Passion political group. Both appealed to younger people through social and frequently beat traditional media to breaking ‘Occupy’-related stories. Twitter, Facebook, Reddit, Vine, HKGolden, Whatsapp and other social platforms have been used extensively by protesters and the public to keep up with news of the movement in real time. The trends reflect a hunger for high-speed news as well as a challenge to existing media outlets. Coverage of the Occupy protests was heavily restricted in mainland China. As thousands of pro-democracy protesters faced tear gas near to the Hong Kong legislature, state media featured local pro-Beijing groups preparing for the 65th anniversary of Communist Party rule. Internet search terms related to the Umbrella Movement were censored as Beijing attempted to manage public opinion and prevent “contagion”. Outlets such as Global Times, People’s Daily and China Daily referred to the protests as “futile” and “doomed” to failure. Meanwhile, outlets such as NTDTV and Epoch Times – with a strong slant against the Communist Party – took advantage of the outpouring of dissent, covering the protests in detail and emphasising the police use of force. On the evening of October 14th, more than two weeks into the occupation protests, demonstrators temporarily seized control of a key thoroughfare to the rear of Hong Kong’s legislature. The Hong Kong Journalists Association were among six press unions which complained to the police that reporters were removed from the scene without reason and “forcibly manhandled”. The unpredictable front-line clashes between protesters and police made for a dramatic and, at times, dangerous evening for members of the press. The scene also presented an editorial challenge for reporters working for outlets with a pro-establishment slant or titles under state control. Difficulties would have also arise for those reporting from a more pro-democracy angle as protesters actively sought to expand the occupation area and challenge police cordons. In this project, our group will revisit our own original reports, photographs and videos of the Lung Wo Road incident and present them from two different perspectives. Our reports will be factually accurate, we may include elements of bias, sensationalism, spin, omission and concision to help shape the opinion of readers and viewers. One version will retell events from a pro-democracy point of view, another version will present a pro-establishment viewpoint. The challenge represents a very real process that takes place in Hong Kong and Chinese news rooms – to different degrees – daily. Personal journals are included to justify our choices and help us to reflect upon the trials of ‘reporting with an agenda’. 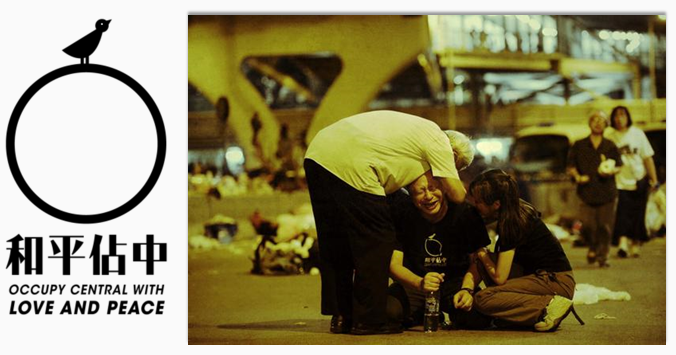 Having witnessed much of the unrest on Lung Wo Road, it was a challenge to retell the story from biassed perspectives. The situation on the ground was not black-and-white. It was not a story about police brutality where the authorities had suppressed freedom of speech. Nor was it a story of passive, peaceful demonstrators expressing their beliefs. There was a minority of protesters and police officers who acted inappropriately during the clashes and there is a journalistic duty to report on inconsistencies on both sides. In the pro-establishment version of my photo story, I used loaded, negative terminology such as “invaded”, “radical”, . And more subtle terms such as “activists” instead of “demonstrator”, “wild cat action” instead of “protest”. I note that police “resorted” to force as protesters obscured their identities. The main focus was on the extreme actions of the demonstrators and the inconvenience caused. In-keeping with how Pro-Beijing outlets have covered the protests, I chose images which highlighted police efforts to manage the situation whilst avoiding shots of protesters. The final shot gave a wider context to the day’s events depicting a demonstration earlier in the day led by ‘anti-Occupy’ counter-protesters. The pro-democracy photo story was more comprehensive. The wider aims of the protesters was given emphasis, their equipment was described as “defensive” and news of injuries on the protester-side was given more prominence. Editing a news package from a biased viewpoint felt wrong from the beginning. But it also was a lot of fun. I felt uneasy with every single cut I made, it seemed to be a betrayal of all the standards and ethics I have accumulated during the last six years of practising journalism. It also revealed my own stance in the protest, which seems to be that I am sympathising with the movement. I decided to focus on police brutality and to depict the protesters as peacefully, non-violently occupying public space. I left out all the aggressive moves towards the police, which indeed did happen. I also failed to mention that they blocked the traffic. If one watches the piece, it appears that they just occupied another road, and that there were no real consequences. I selected the soundbites from the three interviews first. Michael actually had a quite diversified opinion about the police’s actions and how police officers were under heavy stress themselves, and showed a lot of sympathy for their behaviour. I cut that all out. In terms of images, I focused on friendly, pretty and smiling protesters, and tried to avoid skull masks, dark clothes and swearing people. We also had good images of protesters carrying concrete blocks to the tunnel, hoisting them directly into the frame. I avoided these and focused on hands fixing the zip ties of the barricades. The overall image should be nice and peaceful students, who will be beaten down by angry, shouting policeman. For the police side, we had many images of officers milling about quietly, even smiling. In some scenes, they were politely asking protesters to step back many times. After everything was over, some police officers were standing in circles with protesters and quietly chatting about what had happened. I left that all out and edited a collection of angry faces, men pushing and throwing people on the ground. I also left the natural sound louder than normal, so that the viewer can hear the angry shouts and swears better. The arrest of Ken Tsang Kin-chiu, which is featured with TVB footage, shows the culmination of police brutality during that night. If it were an objective piece, a statement from the police should also be included, and also the footage which shows Tsang pouring liquid from high ground on policemen underneath him. This time, I only show the beating without context. While all the mentioned factual information is correct, I selected it very carefully. I left out the official press releases from the Hong Kong government, and also their whole argument that the movement and the occupation are illegal. The whole government side is missing. The goal was to make the protesters’ action look like it was a perfectly legitimate attempt to reach their goals, with reasonable measures and boundaries, and at the same time to depict the police action as an unreasonable and cruel response. Watching different drafts, it kind of astonished me how subtle the whole package felt in the end. It does not feel too populist or misleading to me. It only does so if you have the whole material in mind, from which the clips were chosen and edited from. When I compare the available material we had at hand with the final product, it becomes very clear that the editing was biased. It showed me how powerful editing is and its importance, in addition to shooting, producing and directing. The editor is able to change the meaning and message of many clips by just cutting at the right frame. It also revealed, thankfully, that I seemed to have a strong inner compass, which told me from the beginning that what I was doing was wrong. At last, I realised that I do sympathise with the movement more than I thought I would, as I struggled to show them in a false light, which seemed to not give a wrong image of the whole movement. It would be interesting to do the whole shooting in the field with a bias, too, including interviews with biased and leading questions. In this case, we only worked with an archive of with footage of three people and took out whatever suited the agenda. When the protests started, I found myself in a very difficult situation. As a Hong Kong native, especially as one who supports the democratic movement, it was hard for me to cover the demonstrations without bias. But I managed to hold the balance not long after, thanks to more on-the-field reporting experience and freelance opportunities. The topic for our project is “Reporting with an Agenda”. My task was to report from a pro-establishment perspective, and it has provided me with a whole new view on reporting news. I would say I am quite familiar with unbiased reporting unbiased and coverage with a pro-democracy bias. But before working on this, I had no idea at all how to report from a pro-establishment perspective. 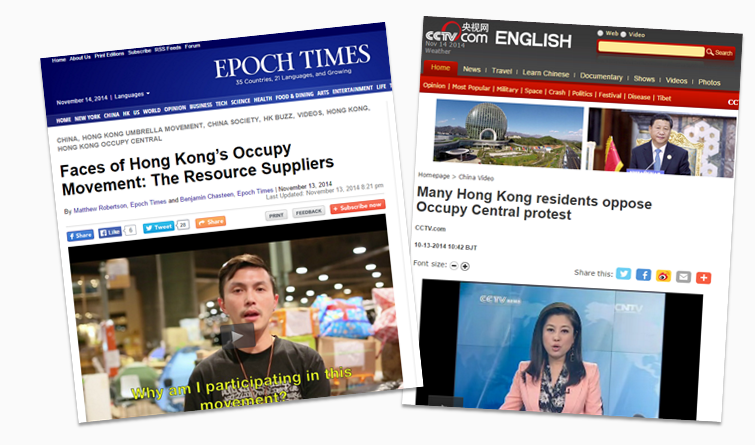 I had heard about how biased pro-establishment media to the Hong Kong and Beijing government are, but never consciously seen watched the actual reporting from such media outlets. Therefore, before I started to work on my part, I had to do a lot of preparation, which I did by watching CCTV, ATV or even TVB to get a closer and detailed look on the techniques and approaches the pro-establishment media used in reporting the recent protests in Hong Kong. The most inspiration to act like pro-establishment journalist came from CCTV. 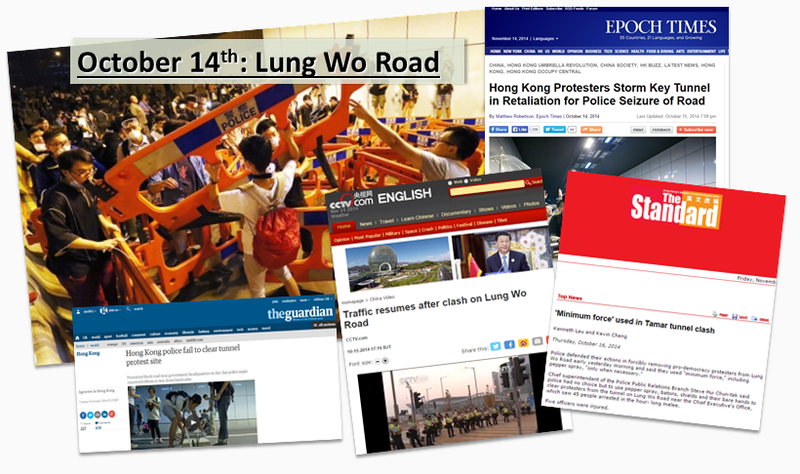 For example, in one of their packages about the Lung Wo Road clashes back on October 15, they tried very hard to avoid showing protesters, and most of the images focused on police and the natural environment. The only protesters I could see were idling behind a reporter who was doing a live standup in Tamar Park. I could also see a few tents in the background. That was all. Furthermore, all selected interviewees were all against the protests. To follow the CCTV approach was kind of hard for me, because we I had limited b-roll of police available, but hours of b-roll of protesters. Therefore, I decided to mix the approaches of CCTV and ATV. ATV is also biased towards the government, but they do include shots of protesters. They normally combine that with a voice over which is biased against them and their actions. I focused on how professional and friendly the police were during standoffs with protesters and also the unlawfulness of the protesters’ actions during that night. Here I used the same b-roll as in the pro-democracy package. It shows a girl writing slogans with chalk on the wall of Lung Wo tunnel. Of course, I got to say she was damaging public property. I introduced this night of clashes with protesters taking barricades and concrete blocks from the roadside, which are in fact public property, to block the road illegally and blocking the traffic. Then I edited in images of stationed police officers, who were surrounded by protesters to block their way, with the intent to show the professionalism and patience of the police force. I also included clashes between protesters and police, and again, I used the same footage as in the pro-democracy package, but I used a classic misleading technique here, which is not showing all the facts. In the other package, we could see the police charging into the protesters and beating their umbrellas, but in mine, I cut out the part of police charging forward and started with the police taking away the umbrellas from protesters. This editing technique along with my voice over has given an image of protesters charging towards the police and the latter defending themselves. Furthermore, although I had the same interviews available as in the other package, I managed to pick out tiny parts that mislead the audience. Michael’s soundbites comment on how stressed and calm the police were and how mad the protesters went, along with b-roll of protesters swearing at police. The editing of these soundbites show how biased use editing techniques to skew what interviewees said to give the reporting their own slant. Overall, it was a lot of fun to report and write in pro-establishment perspective, and I couldn’t stop myself from laughing for several times while I was working on this project, as it felt so ridiculous to report like that. I think I am pro-democracy myself, so it is not really an issue to hold the balance and report without bias. But for a democrat like me to work for pro-establishment media, I believe that would very hard long-term. I hope I wouldn’t be working for pro-establishment media in the future. Police used pepper spray and batons to disperse pro-democracy protesters from Lung Wo Road last night, an important thoroughfare to the rear of Hong Kong’s legislature. Forty-five people were arrested. Earlier on Tuesday morning, police cleared Queensway to the north of the main Occupy encampment in Admiralty. Protesters occupied Lung Wo Road at around 10pm. Police announced that the protester’s actions were illegal. The scene was cleared a little before 3am on Wednesday morning as police used batons and pepper spray to disperse the crowd. Reporters witnessed police pushing protesters down on to the road and tying their hands with cable ties during arrests. A 20-year-student, identified only as Mr Chan, was among those arrested. Chan was detained for 20 hours and said a police officer pushed him to the ground and kicked him. Still in shock, he said that before he had realised what had happened, he had already been detained. He Jiada, a reporter from the Apple Daily was allegedly beaten by police, despite showing his media pass. He was hospitalised after one of his injuries became swollen like an egg. Later, a video has emerged of a protester allegedly being beaten by several police officers. The protester was lying on the ground without any resistance during the four-minute ordeal. Another video includes footage of the police using pepper spray at close range, despite the protester adopting a passive ‘hands-up’ position. After the video of the police beating protesters were aired on local TV, Hong Kong police said that they would conduct a “fair investigation” of the case. They have already been condemned by Hong Kong people due to the violent scenes earlier in the protest. At a press conference after the clearing, the police made no reference to protester injuries, but four police officers were reported hurt. Many protesters on the scene insisted that demonstrators had not attacked police. The pro-democracy protests have been ongoing for 20 days. The police have used tear gas and pepper spray during the demonstrations, raising questions about the use of force against unarmed citizens. Hong Kong police cleared Lung Wo Road last night, arresting 45 people. Earlier that morning, police cleared Queensway to the north of the illegal ‘Occupy’ protest camp, but hundreds of protesters refused to disperse. Instead, they moved to Lung Wo Road, occupying it throughout Tuesday evening. Around a dozen protesters suddenly rushed into the critical thoroughfare at around midnight, pushing barriers on to the road and blocking oncoming traffic. Some protesters pointed to the police while cursing. The police stayed clam, asking the press to take care of themselves in case they were injured during the unrest. As more protesters gathered, they gradually pushed the police line back and occupied a key tunnel to the rear of government headquarters. Cars were forced to turn back. Protesters secured barriers with tape to block the tunnel, making it harder for the police to clear. Around 3am, police announced that the occupation was illegal and warned the protesters that they will clear the road. By 6am, the clearance was complete and traffic was back to normal. Tsui explained that before the clearance, police had already asked the protesters to leave but they refused. “Lung Wo Road is crucial to Hong Kong‘s traffic, so it is necessary to disperse the protesters and reopen the road,” he said. It has been more than two weeks since the protests began. Hong Kong police have tried to maintain social order, as some roads and districts remain blocked. I was there the very beginning of the protests – the last day of the student boycott. Hundreds of students broke into the city park, and unprepared policemen used pepper spray to stop them. One day later, the occupy protest was announced. I was at the scene of the protest in the early days, but was aware of my limits. It was a large protest covering three different districts. It was impossible for one reporter to know all of what was going on. It is even harder to produce a story showing every perspective of the protest. Sometimes, different outlets will have a standpoint even before the reporter arrives on scene. This may explain why one reporter may have a particular angle for certain story. For this task, I was planning to think as a journalist with a pre-defined standpoint before I even started to write. First, I had to select the facts. Without balancing both sides, I needed to focus on the facts that best suited my agenda and omit the ones that do not support the standpoint. At protests, you will always hear different accounts from the protester and police side. They may contradict each other. As a reporter, you should have a good judgement of the facts. But as I collected quotes from both sides, it was actually my decision about which end up in the article. Even though the best journalistic practice would be to show both sides. As I wrote the articles, I realised that I should be careful with the words I chose. Some minor changes would result in different meanings. The right way is to write with no judgement, but – to fit my agenda – I used some words and phrases to manipulate the reader to believe things from my perspective. Sometimes, I did not even notice that I had written something misleading. I noted that it may not always be the writer’s original intent to mislead though sometimes it is possible the reporter did so on purpose, especially for political articles. During the occupy protests, I’ve already seen many reports using misleading language.It did not feel right to only stress one side of the story and then finish, adding some information about the other side. When I was writing the story from the pro-democracy point of view, I collected many details and quotes to use. As for the pro-government one, the fact that police used pepper spray and were filmed beating a protest were undeniable, but I chose to write less about these details and focused on why the police acted. If you read only one report in a certain newspaper, then you may only get information from one single side. It is sad to see most local media, even international ones have their agenda on specific issues, but sadly it is the truth. This is a group project for the ‘Critical issues in journalism and global communications’ course taught by Alejandro Reyes at the JMSC of the University of Hong Kong.